Cathédrale Notre Dame d’Amiens in Picardie is the largest Gothic church in France and a UNESCO World Cultural Heritage listed site. Amiens Cathedral (Cathédrale Notre Dame d’Amiens) is an early 13th-century Gothic masterpiece of superlatives. It is the largest Gothic cathedral in France with the highest nave of any completed medieval church in the country. A very short building period ensured a rare conformity of style. The cathedral is not generally visited for its medieval stained-glass windows but the wonderful art and statues make up for it. Amiens Cathedral is inscribed twice on the UNESCO World Cultural Heritage list – once as part of the Pilgrims Routes in France to Santiago de Compostela and once in its own right. Surprisingly little is known about the details of the construction of the Cathédrale Notre Dame d’Amiens, which became the biggest Gothic church in France. This is partly due to Amiens turbulent history and fire destroying much of the records. A fire totally destroyed the Romanesque cathedral of Amiens in 1218. Construction of a Gothic replacement started in 1220 with the western façade and the nave, rather than the choir as was more common in the Middle Ages. Work on Amiens Cathedral progressed at an astonishing speed – partly due to the local sandstone being relatively easy to work and partly due to modern techniques that allowed stones to be cut off-site in a weather proof area that allowed work year round. Historic sources differ on when aspects of the cathedral was completed but the building time of around half a century was very fast in comparison to most other Gothic churches where structural work often dragged on for centuries. The western façade was probably completed already in 1236 with the nave done a decade later. Work slowed due to a lack of funding but by 1269 the chevet was completed. 1288 – the date of completion of the transepts – is generally accepted as the date of completion of the church. During the 14th century, the side chapels were added to the nave, while the western façade higher than the rosette and the south tower completed at this time. The higher north tower was finished by 1402 and the central tower with steeple in the 16th century. Amiens suffered some trials and tribulations through the centuries but the church survived in surprisingly good condition, although most of the medieval windows have been blown out during one war or storm or fire or another. Amiens was under siege for half a year in 1597, fought over during the Franco-Prussian War (1870-71), almost destroyed during the First and Second World Wars, and suffered economic deprivation during much of the later twentieth century. Cathédrale Notre Dame d’Amiens is the largest Gothic church in France. It also has the second highest Gothic nave in France, although with only a single bay completed, Beauvais should probably be disqualified. 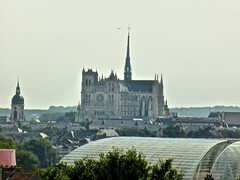 The church towers over the town and can be seen even from far outside Amiens. The exterior of Amiens Cathedral is dominated by the massive western façade – the first part of the church that was constructed in the early 13 th century. It is richly decorated with a recent cleanup leaving the stone almost white. The western façade of Amiens Cathedral has three deep portals – the smaller side portals have images of St Firmin (north / left) and Mary, Mother of Christ (south / right). St Firmin is credited with bringing Christianity to this part of France during the 4th century. However, it is the large central portal that attracts the most attention. The doors of the main portal are split by a trumeau with a statue of the Beau Dieu (Christ). The doors are flanked on both sides with statues of the apostles. 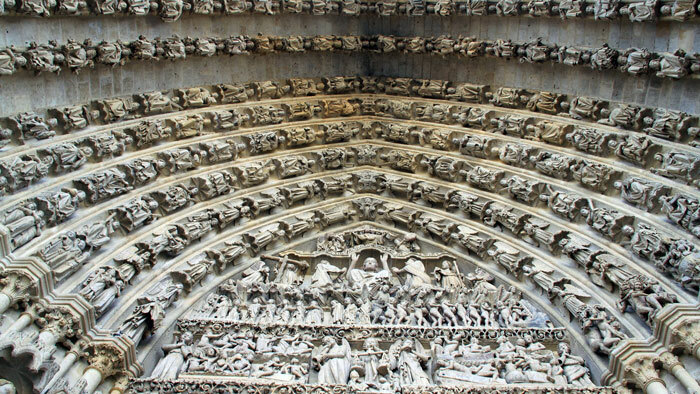 The tympanum and triumphal arch of the portal has numerous angles, martyrs, and virgins with the Tree of Jesse forming the outer ring. 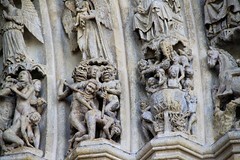 The tympanum is a marvellous work on the Last Judgment. On the lowest level the souls of the dead have risen and are weighed – note the devil trying to influence the scale. On the mid-level, the damned are led into the mouth of the Leviathan, while on the opposite end St Peter allows St Francis of Assisi to be the first to enter Paradise. 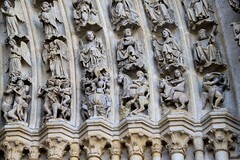 The tympanum has insufficient space for all the depravations of hell, so a few scenes such as the boiling cauldron flow over onto the lower level of the rings of angels and saints. Above the portals are a gallery and a row of 22 oversized statues of kings – not all can be identified. 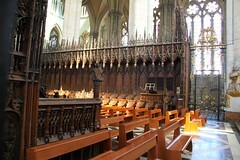 The extraordinary height of the nave required the rosette to be above the row of kings (and not below as for example in Reims or Paris, or to the side as done in Rouen). The decorations higher than the rose were added in the 19th century by Viollet-le-Duc, as were the decorations on the arches on the level of the kings. Although the north tower is about the same height at Notre Dame de Paris, the towers here are relatively low compared to the very high roofline required by the high nave. Both towers are strictly speaking half-towers, as they used – probably as a cost-saving measure – only half of the square foundations. 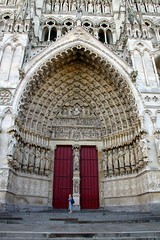 The south, or St Honoré, portal of the cathedral of Amiens is also noteworthy. 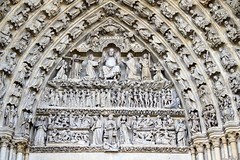 The portal feature many biblical figures, including the apostles in discussion on the lower level of the tympanum and a famous statue of the Virgin on the trumeau. 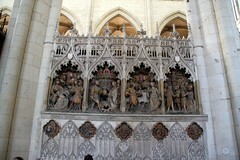 The chevet of Amiens Cathedral shows typical Gothic features including flying buttress. These were spaced too far apart and were later strengthened. Furthermore, a chain, fitted red hot, was added to prevent the chancel from falling apart. The steeple was constructed after the destruction of the original by fire in 1526 but lowered a century later to the current 112.7 m – the sixth highest steeple still standing in France. 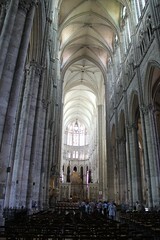 The most impressive part of the interior of Amiens Cathedral is the sheer size of the building. Due to the size of the building further art works on first glance simply pale in comparison to the outsize dimensions of the pillars and other Gothic architectural elements. Visitors normally enter via one of the side aisles, which are at a height of 20 m almost double that of Notre Dame in Paris. However, it is the nave where the pillars seem to soar forever. Most of the glass in the nave is clear allowing the church to be flooded by natural light. 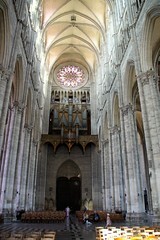 At 42 m, the three-tiered nave of Amiens Cathedral is the highest of any completed Gothic church in France. Nearby Beauvais wanted to outdo Amiens and built to 47 m, however, funds ran out and although the choir achieved this amazing height, only a single bay of the nave was completed (and is mostly occupied by the organ). 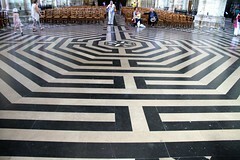 The large labyrinth formed by white and black tiles in the floor of the nave of Amiens Cathedral is a 19th-century reconstruction of the original from 1288. The central stone is a copy – the original is in the Picardie Museum. Very little in the side chapels are original to the church as is obvious from the uniformity of the decorations and ironwork. Almost all visible parts here are 18th century, as is the elaborate pulpit with golden accents. The organ is at 17 m the highest in France. The lower sections from 1442 are amongst the oldest in France but the organ itself has been restored and altered many times through the centuries. The magnificent early 16th-century wood-carved choir stalls have more than 4,000 individual figures – a close-up look is only possible with a guided tour. In the ambulatory at the back of the choir on the 17th-century funerary memorial for Guillan Lucas is a statue of a weeping angle, which was a favorite postcard theme during the First World War. In the Sacred Heart Chapel, flags from various allied armies from the First World War are displayed. Only very small parts of the stained-glass windows are medieval. More impressive are the various Renaissance polychrome sculptures. In the south ambulatory is the history of St Firmin but for most visitors the life of St John the Baptist (completed in 1531) would be more familiar. Opposite the life story of St John the Baptist is a reliquary (19th century copy of the medieval original) with part of his skull. 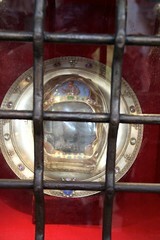 Wallon de Sarton brought this relic back to Amiens in 1206 from the fourth crusade. It was one of the treasures that inspired the huge size of the Gothic cathedral that replaced the smaller Romanesque church. Relics and pilgrimages were big money earners in the Middle Ages – Amiens was inscribed a second time onto the UNESCO World Cultural Heritage list in 1998 as one of the stations on the French pilgrim routes to Santiago de Compostela in Spain. Amiens Cathedral has been a listed site on its own merits since 1981. 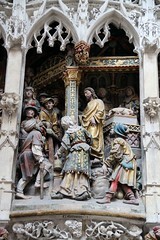 In the northern transept is a Renaissance polychrome sculpture of Christ chasing the moneylenders out of the temple. The nearby font is from 1180 and was originally used to wash the dead prior to burial. During summer months, as well as in December, the façade of Amiens Cathedral is lit up in colorful lights. In contrast to many other similar light-and-sound projects throughout France, the lights here are specifically designed to show the colors that the façade and statues were painted during the Middle Ages. Medieval Europe’s taste was a bit kitsch (the same went for Roman sculpture too!) and not the bare stone that has been presented as authentically medieval only since the 19th century. The light show is held in June at 22:45, July at 22:30, August at 22:00, September at 21:45 and in December at 19:00. 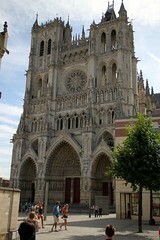 Amiens Cathedral is a working Roman Catholic church and thus has long opening hours and free admission. 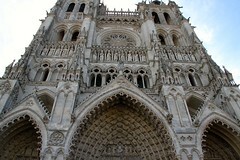 Amiens Cathedral is open daily from 8:30 am to 5:30 pm (6:30 pm from April to September). Visits may be restricted during services. 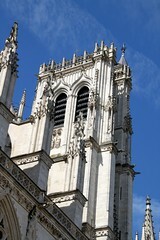 The western façade and towers of Amiens Cathedral is managed as a French National Monument. Admission is €5.50 for adults, free for all under 18s (but not for groups), and EU nationals or French residents 18 – 25. April, May, June and September – guided tour on weekdays at 3 and 4:30 pm, unguided visits on weekends from 2:30 to 5:15 pm. July and August: tour at 11 am and unguided visits from 2:30 to 5:15 pm. October to March: tour at 3:45 pm. Amiens Cathedral is one of the top Gothic sites to see in France but with Amiens somewhat off the main modern highways and high-speed railway lines sees fewer visitors than its beauty warrants. 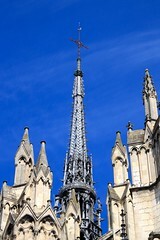 However, for lovers of Gothic architecture, it is well worth the detour. Amiens proximity to Battle of the Somme and other First World War sights will probably see an increase in visitors during the centennial of the Great War. French train tickets may be bought directly from the official websites of French Railways – Voyages SNCF (UK £) or RailEurope (USA & Rest of the World). Print at home is usually the best option. 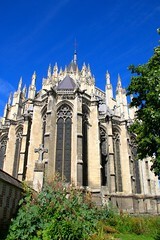 Other great Gothic churches in France: Rouen, St Ouen, Bayeux, Bourges, and Strasbourg.